One of the most famous stops on the creepy tour of Europe is the Capuchin Crypt of Palermo in Sicily. The city's Capuchin friars began digging the catacombs in the 16th century to bury their own dead. Nobody knows why they started embalming the corpses and standing them in racks, but the practice goes back at least to 1599. 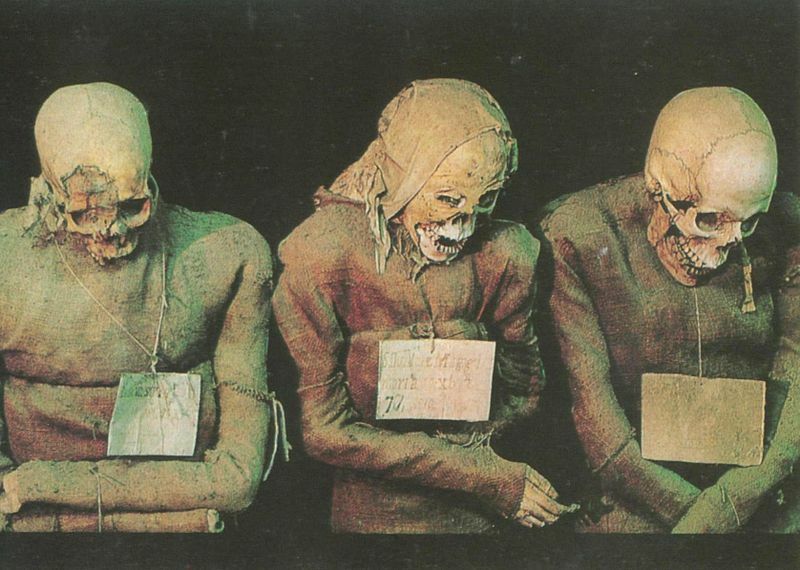 All of the bodies were dried on racks and washed with vinegar; later, more elaborate methods were used, which resulted in the freakish preservation of some bodies. 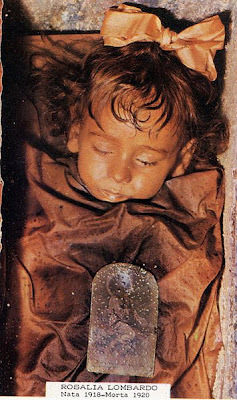 This is the famous body of Rosalia Lombaro, entombed in 1920, photographed in 1995. At first the catacombs were only for friars, but when wealthy patrons began asking for burial in the crypt, the friars obliged -- for a price. To keep your grandmother standing in a rack or laid out in a glass coffin required an annual donation, and if the family stopped paying the corpse was staked away on a shelf. Burials stopped in the 1920s. The catacombs are now open to the public. The rules say that photography is forbidden, but to judge from the number of pictures I have found in a few minutes of searching, this rule is enforced about as well as Italian traffic laws. The number of different ways we humans have responded to our dead fascinates me. David Frum vs. Gun-Toting "Sheep Dogs"
Of course, the vast majority of people who carry legal weapons will never draw them in a situation of danger. If their guns are ever used, it is because they have been stolen by a burglar who targeted their home precisely in order to get hold of their guns - or in the suicide of a depressed relative - or in some stupid dispute that they themselves start because emboldened by a gun - or in some heart-rending accident. It is only after the fact, and tragically often, that we discover that the greatest threat to our family came from our own poorly conceived yearning to protect them. American universities think they have big problems, but at least they don't have the trouble universities have in Jordan. Classes have been cancelled this week at Al Hussein Bin Talal University after four people were killed and 25 wounded in a gun battle between students who belong to different tribes. According to witnesses, the students had been supplied with weapons by their families. This is at least the second such fatal gun battle at a Jordanian university this year. I was ravenous. For food. For life. For the stories that I would write, except that everything was effervescent and inchoate in my overexcitable brain. . . . 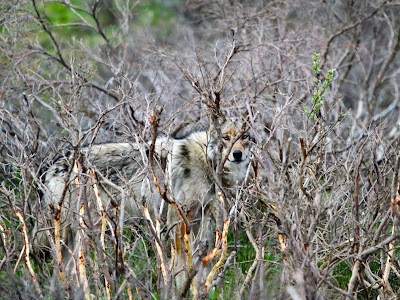 I wished to be drawn into the wild heart of things. An abandoned railroad line near the town of Klevan in northwest Ukraine, christened "Tunnel of Love" by the locals, and much loved by worldwide fans of abandoned places. From here. The old city of Sanaa, Yemen, looms up in its mountain valley like a vision of a lost world. It seems like a mirage, or one of those paintings they use in the background of fantasy movies. But it is a real place, 6,000 houses and 103 mosques within a crumbling wall that once protected it from bandits. 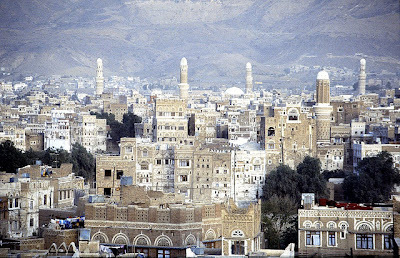 Sanaa sits astride the ancient inland trade route that ran from Yemen's ports across Arabia to Mecca, Syria, and the Mediterranean. Here in this valley of many springs, caravans could refresh after the crossing of the desert. 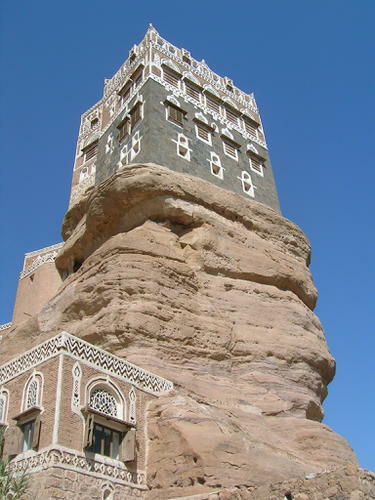 There has been a city on this spot since 200 BCE. When Islam came, Sanaa became a center for its spread, full of mosques and scholars. 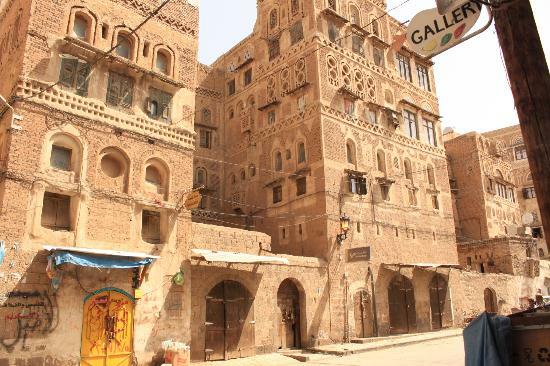 Although the city is ancient, few of its buildings are more than 200 years old. 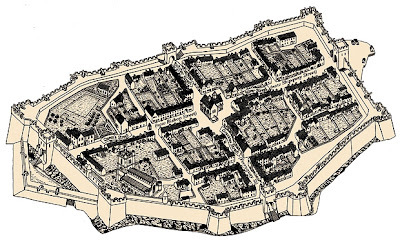 The city was completely reconfigured after it was conquered by the Ottomans in the sixteenth century, in the time of Suleiman the Magnificent. The Ottomans replaced most of the mosques, palaces, and other pubic buildings. (They also built a Turkish bath in every district.) The houses are just not made to last forever. Most of the old houses have a ground floor of stone, which was used for storage or even stables. The floors above, where people lived, are made of adobe brick. Some are sheathed with a single layer of fired brick to protect them from the elements, others only with plaster. It does rain in Sanaa, so the adobe decays over time. Local custom has been that when a house starts to crumble, it is torn down and a new one built. Sanaa has been a UNESCO World Heritage Site since 1986. 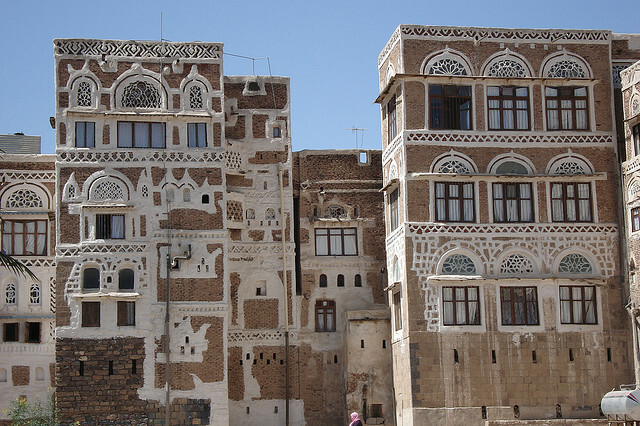 Just this week, though, UNESCO threatened to revoke Sanaa's status if Yemen doesn't do more to protect the city's historic atmosphere. The old city is threatened by the same forces that are degrading ancient cities and forts the world over: modernization, money, and bad plumbing. Yes, bad plumbing; every time I read into what is happening at some decaying old fort in India or Pakistan, it turns out that part of the problem is badly built or maintained sewers and water lines, which leak and undermine ancient walls. The same thing is happening in Sanaa. 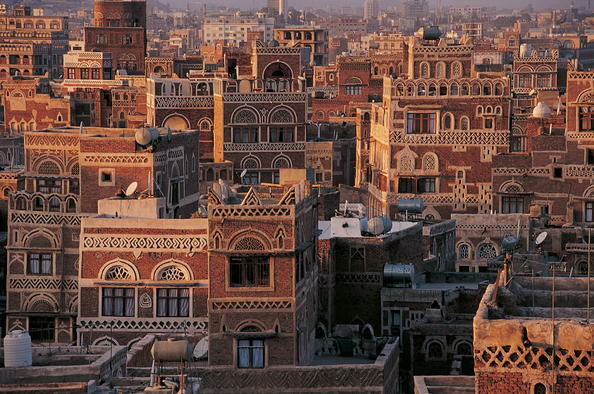 Sanaa is now a sprawling city with more than a million inhabitants. The wealthy families who built the old city's beautiful houses are moving to new villas in the suburbs, equipped with modern conveniences like air conditioning. The old city is increasingly becoming a poor neighborhood where most people are renters. The absentee landlords who own its houses and apartment blocks have little incentive to keep these places up. According to an official with the government's preservation bureau, it costs only about $30,000 to tear one of these houses down and replace it with concrete, but $150,000 to restore it using traditional methods. So when the houses become decrepit, they are increasingly replaced with concrete. In such a crowded city, space and water are both very valuable. 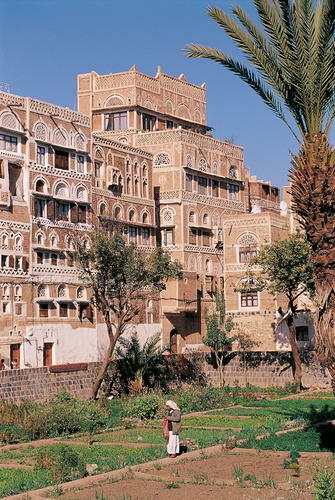 Many of the gardens that were once Sanaa's glory have been built over, their water diverted to drinking and bathing. 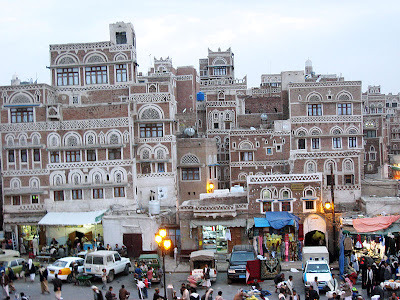 The value of tourism probably insures that at least a good chunk of Sanaa's old city will be preserved. But I fear that concrete, that great monstrous bane of our age, will consume much of this old glory. The more people believed in free-market ideology, the less they believed in climate science; the more they accepted science in general, the more they accepted the conclusions of climate science; and the more likely they were to be conspiracy theorists, the less likely they were to believe in climate science. These results fit in with a longer literature on what has come to be known as “motivated reasoning.” Other things being equal, people tend to believe what they want to believe, and to disbelieve new information that might challenge them. I will say that one reason people feel entitled to ignore scientific findings is that so much garbage has been trumpeted as scientific certainty. Behavioral psychology, for example, or the magical health effects of antioxidants. There is a real difference between worries about human-created climate change and fad diets, in terms of the quality and quantity of the evidence, but from watching television you might have trouble telling this. You have to know quite a bit to understand that whereas behavioral psychology turned out to be mostly bunk, it is unlikely that the link between atmospheric CO2 and temperature will suffer the same fate, and close to impossible that evolution by natural selection will. Scientists need to take the lead in helping people distinguish between bad science, good science, and science that approaches certainty, and we have been very bad at this. 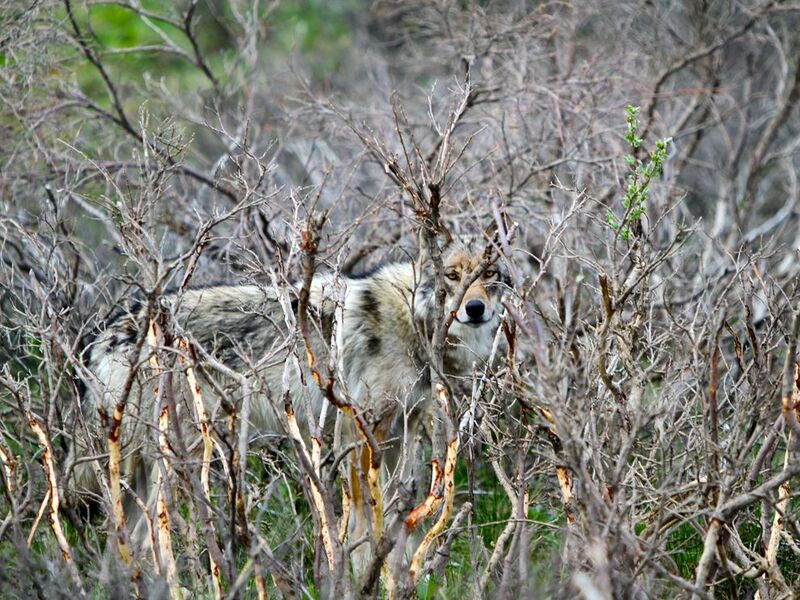 In Denali National Park, by Brian Montalbo. From National Geographic. 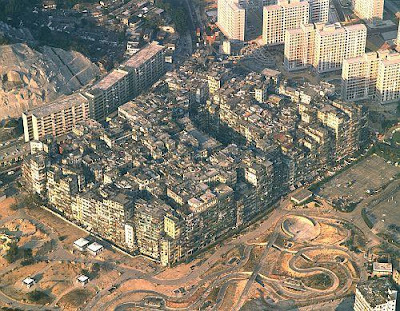 When the Chinese leased Kowloon peninsula to the British in 1898, they retained a 6.5-acre walled compound for themselves. During World War II, the Japanese dismantled the wall, opening the site for settlement. Refugees from the fighting set up a squatters' camp on the site. After the war, relations between the British and the Communist Chinese turned bitterly suspicious. The Chinese pretty much ignored their old fort, and the British, who had enough problems with the Chinese, decided to leave it alone. The result was an anarchist utopia, a place with effectively no government. 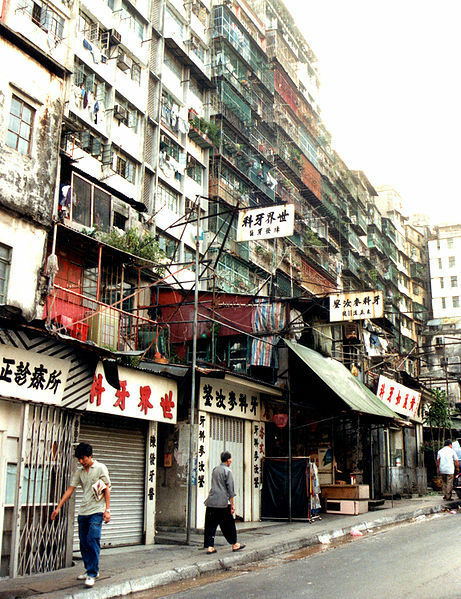 The British only insisted on a height limit of 14 stories, since the site was close to Kowloon airport. The result was this crazy agglomeration of high-rises, built without any input from architects or planners. The only streets were tiny alleys a meter or two wide. 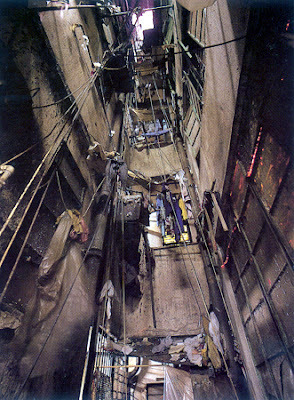 Within this 120 by 210-meter space, 50,000 people lived, making it one of the most densely populated spots in the world. There were also numerous industries, like this rubber plunger factory photographed in the 1980s. In the late 1950s, the neighborhood was taken over by Triads, or gangs. 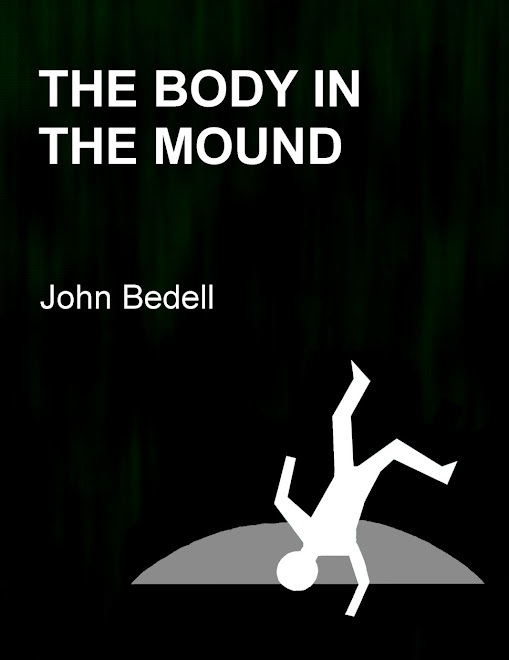 Opinions differ as to whether their rule was benign or thuggish, but certainly the settlement continued to thrive. 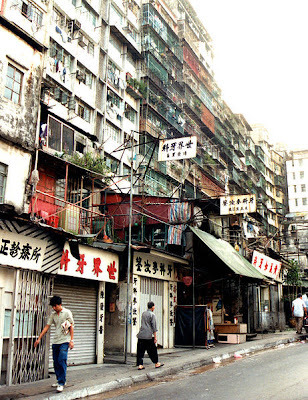 In the late 1970s the Walled City became a center for heroin distribution, and the British government of Hong Kong finally intervened, smashing the gangs and installing a sort of neighborhood council. But British law still did not apply in the city. So there was no licensing of businesses, and the place became particularly famous for underground dentists and surgeons. 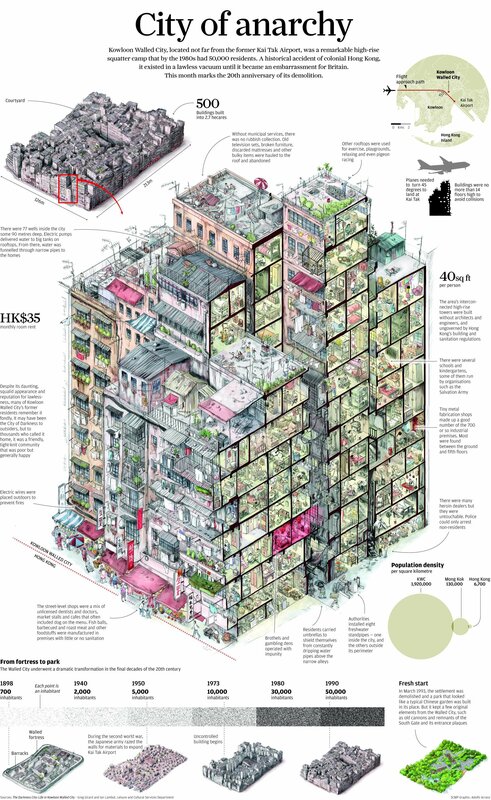 These are from a fascinating diagram of the city prepared by the South China Morning Post. You can view the whole thing here. As China modernized and the return of Hong Kong to Chinese rule approached, the Walled City loomed as an embarrassment to both governments. They eventually agreed that it had to go, and it was demolished in 1994. But though it is gone, it is not forgotten. 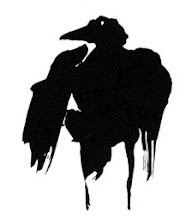 Pictures and articles are all over the web, especially on anarchist sites. As a vision of life without government, does this really appeal to anyone? 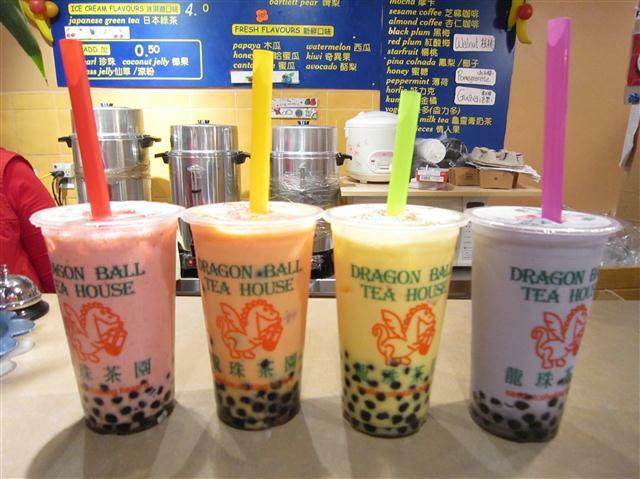 There are now more Asian immigrants in California than Hispanics. And some of them rap about it. Tangier Island, Virginia, famous for the archaic dialect of its 700 residents, is disappearing. The latest sign of the sea's steady encroachment is in the graveyard at the Uppards, now washing into the sea. Archaeologists from the state have been working to move as many graves as they can, but many are already gone. These are stones from graves that have washed away. The highest point on Tangier is only 4 feet (1.2 m) above high tide; islanders call these high spots, old dunes with elevations of 2 to 4 feet, "ridges." Now the island measures about 740 acres, mostly marsh. Only about 83 acres is habitable. The island is losing about 9 acres a year to erosion and sea level rise. It will almost certainly not see the 22nd century. I just made brownies with my seven-year-old daughter, something we have not done in about two months. She said, "Just like old times." Great feature by Ezra Klein on the program launched by Health Quality Partners in Doylestown, Pennsylvania. This is a Medicare-funded program that has reduced costs and extended people's lives by doing something very simple: they have a nurse visit all their patients at home once a week. You might think that Medicare would be looking to expand this program across the country. But no; it was a pilot program, and they are planning to shut it down. This points up the madness of the American health care system, where we spend billions on surgery and drugs whether they work or not, but can't be bothered to spend money on simple interventions that really make people healthier. The system is all about making doctors and hospital companies rich, not helping people. Surgeons have a powerful lobby, so the government pays them huge fees to cut people up even when it is a bad idea. Nurses don't have much of a lobby; they are too busy actually helping people. Not that Medicare doesn't like what HQP is doing. But they are shifting their limited budget for pilot studies toward more grandiose schemes that pay private companies, not for providing services, but for keeping their patients healthy. They hope these companies will use schemes like HQP's. And this is another problem with our health care system, the way reformers focus on Big New Ideas instead of pushing things that we already know help. It makes me gnash my teeth. But the politics have gotten so convoluted and so entangled with mutual suspicion that meaningful reform is all but impossible. Coming up in the garden today. And a mass of self-seeded larkspur in the annual bed. The only tulips to survive the heat wave and the deer are these in the weed-choked bed by the air conditioner. But the pansies look good. The Museum of Contemporary Art in Chengdu, China, completed 2011, was designed both to house a growing art collection and to provide a public space in a neighborhood dominated by high rise housing and office complexes. The architects broke the museum into two parts with a terraced plaza between that they hope will add "vitality" to the neighborhood and "foster a sense of community." The landscaping fuses modernism with a traditional Buddhist sensibility in a pleasing way. The interior seems very simple and sparse in the publicity photos, which I think is the right approach for gallery spaces where the focus should be on the art, not the architecture. All in all, it seems like a fine job, and I expect we will be hearing more from Liu Jiakun and his crew. Lawrence Alma-Tadema (1836-1912) is another of my favorite painters. He was born in the Netherlands and studied in Brussels, but in 1870 he moved to England, where he stayed. There he became a famous and wealthy painter of classical scenes, much collected by the richest men of his time. 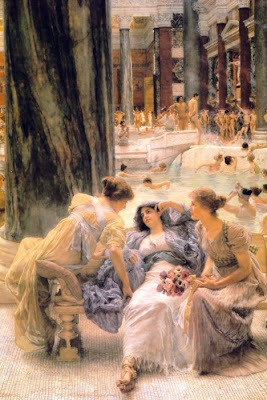 The painting above, The Baths of Caracalla (1899), is a fair introduction to his mature work: rich Romans languidly enjoying themselves in an exactly imagined scene, each detail of their clothing and their surroundings faithfully copied from classical models but the overall effect somehow more 1899 than 250. 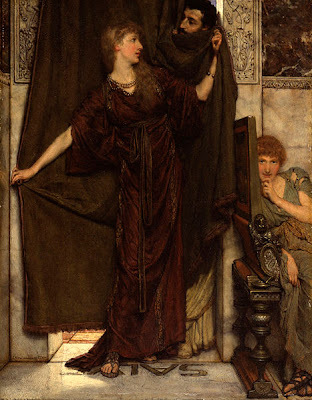 Alma-Tadema married in 1863, just as he was starting his career, but his first wife died in 1869; little is known about their relationship because he never spoke of her again. He had already met the English woman who would become his second wife, Laura Epps, and soon after his wife's death he moved to London and they began consorting. They married in 1871 and had two children; Laura, a painter herself, appears in may of his paintings. 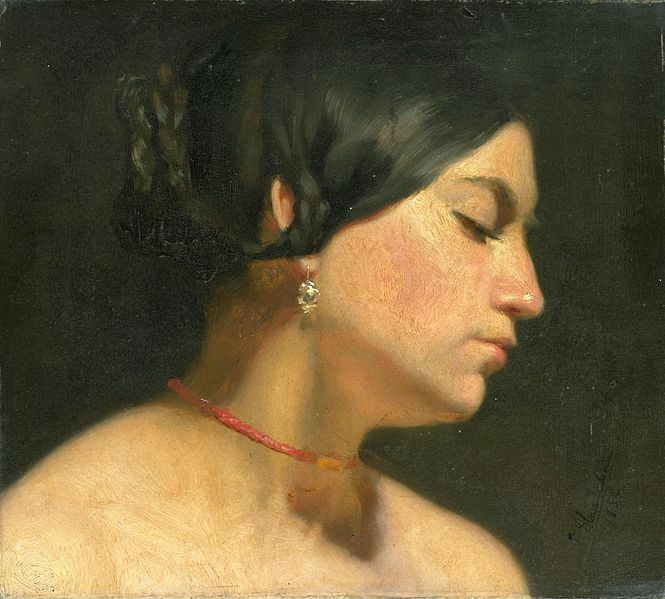 Mary Magdalene, 1854. Not bad for an 18-year-old, hm? 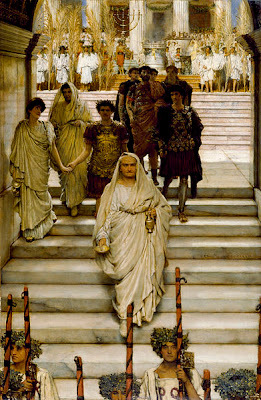 Alma-Tadema had always focused on historical scenes, but this was mainly Frankish or Egyptian until he went to Pompeii in 1863. From then on, he painted mainly Rome. Once he was rich enough he built himself a villa modeled on those at Pompeii, and he filled it with Roman and Greek antiquities. Above, detail from Lesbia Weeping over a Sparrow, 1866. Notice the fabulously detailed clothing and jewelry, and the classical details on the walls and furniture. And also the choice of scene: Alma-Tadema generally preferred the sentimental side of ancient life to the blood and thunder. So far as I can tell, he never painted a battle. Instead he painted festivals, like the famous Spring, 1894. And poetry readings -- A Favourite Poet, 1888. And people just lazing around. Detail from A Roman Art Lover, 1868. He loved the trappings of antiquity, and almost all the statues, vases, and so on were copied from original artifacts in museums, in his own collection, or in the collections of his patrons. He had a weakness for little domestic scenes like this one, My Sister is Not In, 1879. 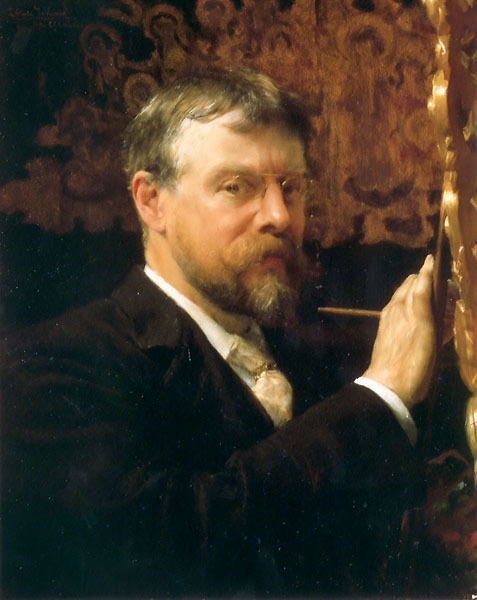 Alma-Tadema's critics have always objected to the pointlessness of his work. Victorian critics thought it amoral and unspiritual; modernists thought it devoid of social or political commentary; tortured artistes thought it too bland and happy. So? A Kiss, 1890. 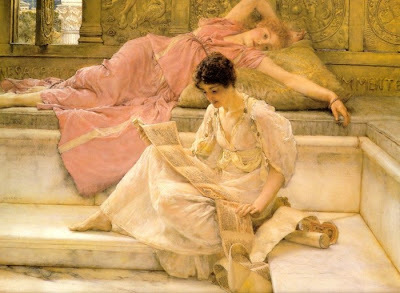 What Alma-Tadema achieved was to put on canvas why some of us find the ancient world so aesthetically appealing. Here is a world different from our own but still recognizable, a world greatly devoted to its own notion of beauty, a world where petty problems and economic turmoil were treated with aristocratic disdain. A world devoted to equanimity, where no one doubted that the centuries old order would endure for centuries more. The problems that we moderns worry about are nowhere in evidence. Silver Favourites, 1903. 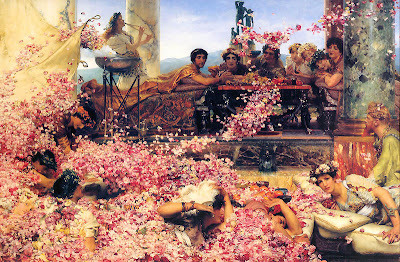 The Roses of Heliogabalus, 1888. This painting depicts an infamous incident in which the emperor known as Elagabalus or Heliogabalus suffocated his dinner guests under a great rain of roses and violets. Elagabalus was much hated by the Roman elite, who accused him of bizarre religious practices, depravity, homosexuality, taking five wives (including one man), and so on; he was assassinated in 222, after just four yeas on the throne. 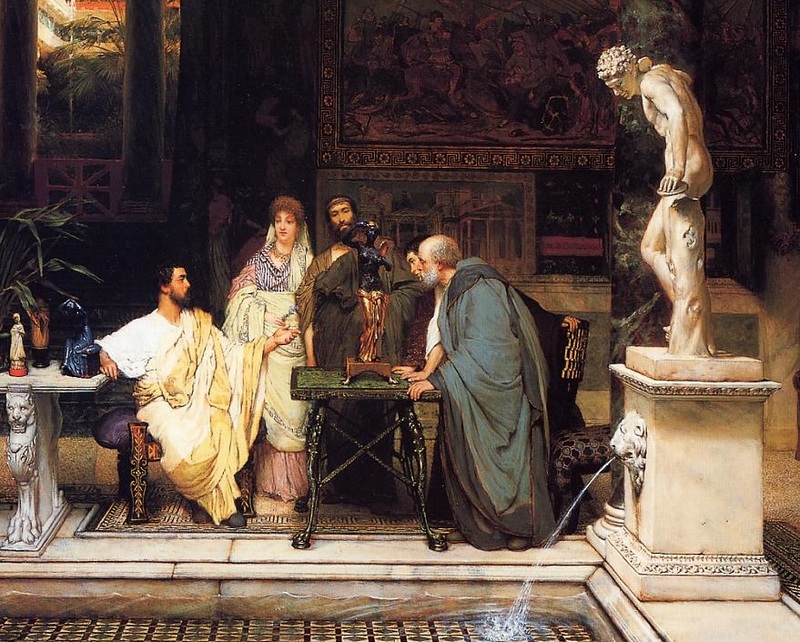 Modern historians are suspicious of all the outrageous stories about him, but Elagabalus became a sort of hero to the decadents of the late 1800s. 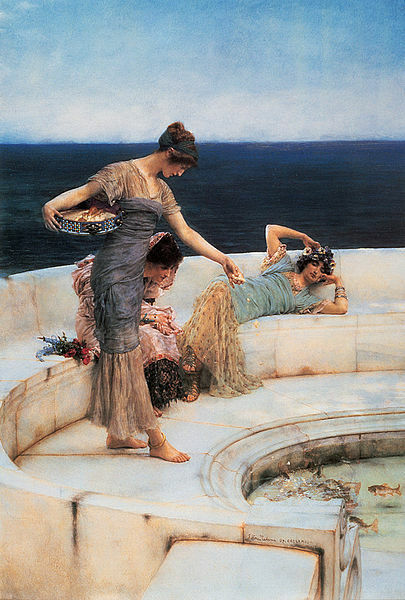 By painting this notorious scene, Alma Tadema was drawing on that controversy to scandalize his own image a little. He also let it be known that though he painted this in winter he wanted to get the rose petals just right, so he had a supply sent weekly from the Riviera. It's always nice to be reminded that artists of the past engaged in the same sort of theatrics as Salvador Dali or Andy Warhol. The Triumph of Titus, 1885. Alma Tadema's Rome never really existed, of course. But it is a lovely dream. 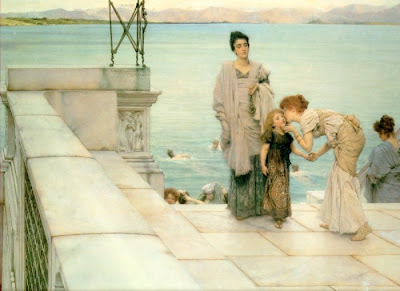 Great collection of Alma-Tadema's paintings. What Movie Does the Boston Bombing Remind You Of? Why Give a Famous Cubist Collection to the Met?